A Brief Sojourn in the Adorable Zone. | Tales of Adequacy! Time out from chaos, in the Adorable Zone. Today was Epic Level Crazy. Thankfully, I had drawn this over the weekend. A weekend without Haters, or Darths, or Suits. A weekend when I saw what passes for family to me, and was able to be a fan, to generally take it easy and do my best to not be stressed or upset. Time well spent, actually. 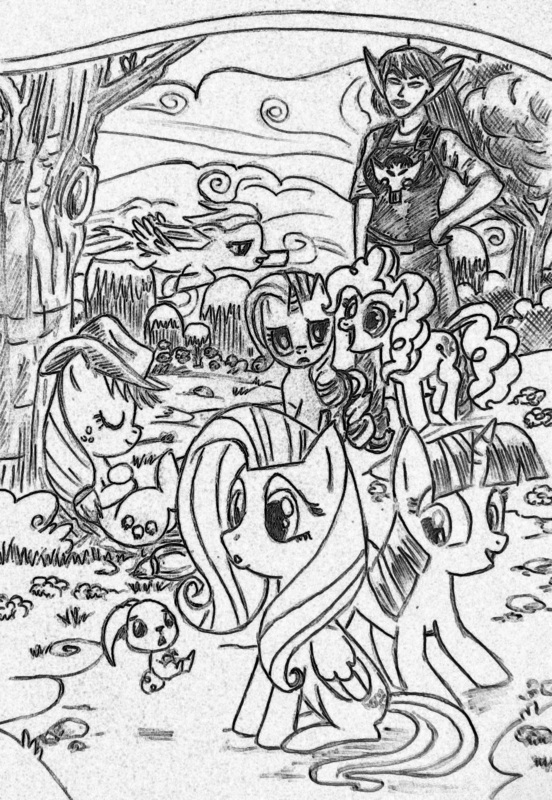 Having spent some quality time with a bunch of Ponies, and also with the artist that does the book for IDW…I thought that I would go back to the school week fully rejuvenated. Honestly…not so much. In an ironic move, we haven’t yet sent home our ten week report card…and it is week twelve. That’s not the irony. The irony is that the grades for the next report card are due next Wednesday…and we haven’t yet sent home the last report card. Or any report card, for that matter. School without report cards might be a dream to students, but is hard for the teachers to get their brains around. Still…I did get to spend the entire weekend with wonderful people, both long time friends, and more recent people that care for my well being. For two days, it was as if the venue where I teach, a crummy world of gang violence and teachers being assaulted, of hypocrisy and general lack of follow through…it was as if that place did not exist. Two days of ponies and bunnies, of lawyers, guns, and Olympic class fencers, two days of gifted artists and people that could teach me about baking, even though I am a cripple in the kitchen. With new shoes on top of it…they were good times in the Adorable Zone.